At the Feb. 5 State of the Union Address President Donald Trump once again appealed to both chambers of Congress to adopt the new United States-Mexico-Canada Agreement (USMCA) reciprocal trade deal that will replace the North American Free Trade Agreement (NAFTA). “Our new U.S.-Mexico-Canada Agreement — or USMCA — will replace NAFTA and deliver for American workers: bringing back our manufacturing jobs, expanding American agriculture, protecting intellectual property, and ensuring that more cars are proudly stamped with four beautiful words: made in the USA,” Trump said at the speech. The agreement itself appears to improve on NAFTA from the perspective of U.S. producers and American workers, as the U.S. achieved significant concessions on country of origin requirements, labor, agriculture, currency, intellectual property, financial services and textiles (see below). 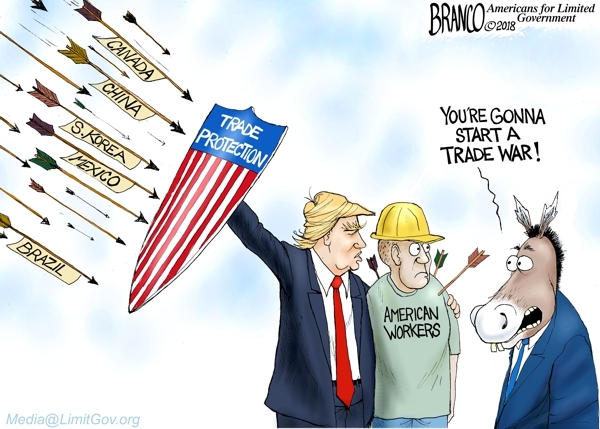 But the biggest incentive of all to pass it may be that President Trump has threatened to leave NAFTA altogether if Congress does not pass the USMCA replacement. Under fast track rules, a vote on the new trade agreement is mandatory. That’s the President’s trump card — pun intended. Many members of Congress might prefer to keep NAFTA as it is, but if they want any trade agreement at all that includes Mexico — before NAFTA the U.S. had a bilateral trade deal with Canada — the USMCA is the only game in town. The U.S. has already withdrawn from the Trans-Pacific Partnership, which included Mexico and Canada and would have effectively replaced NAFTA, too. So now, it’s USMCA or bust. And for those who are simply reluctant to deliver a legislative win to President Trump, they ought to consider that it’s no skin off Trump’s nose to pull out of NAFTA. Either way, Trump would be delivering on his campaign promise to get a new trade deal or else leave NAFTA. But really, Congress should be addressing the trade agreement on its merits, which are well worth considering. Country of origin requirements are being increased to 75 percent, up from 62.5 percent, requiring automobiles will have at least three-quarters of their parts made in North America. Mexico will recognize the right of collective bargaining and all parties agreed that “40-45 percent of auto content be made by workers earning at least $16 per hour,” according to the U.S. Trade Representative. In 2016, average pay in Mexico for manufacturing was $3.91 an hour. In 2017, the Associated Press ran a report entitled “In Mexico, $2 per hour workers make $40,000 SUVs.” This is a tremendous concession, and most certainly an improvement on NAFTA from a U.S. producer perspective. On agriculture, Canada is allowing in greater access for U.S. dairy products. On currency, the USMCA “address[es] unfair currency practices by requiring high-standard commitments to refrain from competitive devaluations and targeting exchange rates, while significantly increasing transparency and providing mechanisms for accountability,” according to the U.S. Trade Representative. Since 2008, the Mexican peso has depreciated against the U.S. dollar by 50 percent, from $0.10 per $1 USD to $0.05 per $1 USD. The new provision will give aggrieved parties an opportunity to target currency devaluation as an unfair trade practices, something that could set a new gold standard for trade agreements. On intellectual property, cross-border copyrights, trademarks and patents will be enforceable to cut back on knock-offs, plus additional protections for pharmaceutical and agricultural producers. On financial services, U.S. financial services will be allowed to compete with local financial services in Canada and Mexico, getting most-favored nation treatment. On textiles, the agreement will “[p]romote greater use of Made-in-the-USA fibers, yarns, and fabrics by: [l]imiting rules that allow for some use of non-NAFTA inputs in textile and apparel trade… [and by] [r]equiring that sewing thread, pocketing fabric, narrow elastic bands, and coated fabric, when incorporated in most apparel and other finished products, be made in the region for those finished products to qualify for trade benefits,” according to the U.S. Trade Representative. These are all wins for U.S. producers, labor organizations and the like. There’s something in it for everyone. Democrats who say they want better trade deals and Republicans who usually support widespread trade agreements will both be hard-pressed to say no. Overall, Trump is doing exactly what he promised to in the Rust Belt states he picked up in 2016: Ohio, Pennsylvania, Michigan and elsewhere. Those were the states that put him over the top in the Electoral College. Trade was the issue that got him to the White House. The choice for Congress is simple: NAFTA will be terminated, or replaced by the USMCA. Members may not appreciate being leveraged in this manner, but that’s the way it is. Either way, President Trump will be keeping another key promise he made to his base in 2016.